An interstellar play for kids and families about bullying, conflict, and doing the right thing when the universe goes wrong. Come join us for a scifi adventure at the Montgomery College Cultural Arts Center this fall! Voytto Tech: a scifi fable combines science and technology with a story exploring the tough topics of bullying and social inequity. Klipp Casey travels from a planet far, far away to study at Voytto Tech, the most famous science magnet school in the galaxy. Right away, Klipp has trouble fitting in at his new school, and becomes a target for bullying. What can Klipp do? Who can he go to for help? And what can anyone do about the huge energy crisis threatening the planet? This highly interactive play is performed by three actors who become a variety of characters. The entire audience participates from their seats, becoming characters in the story and brainstorming possible solutions for Klipp's problems. No play can or should offer an easy solution to the complex problem of bullying and social inequity; Voytto Tech offers schools an opportunity to open up dialogue about these complex issues, in an engaging and interactive way. Come early with your kids for crafts and pre-show activities, and stick around afterwards for a Meet-and-Greet with the actors--it's a great time to get autographs, take pictures, and tell us your favorite part of the show! The Pre-show activities table opens 30 minutes before the performance. 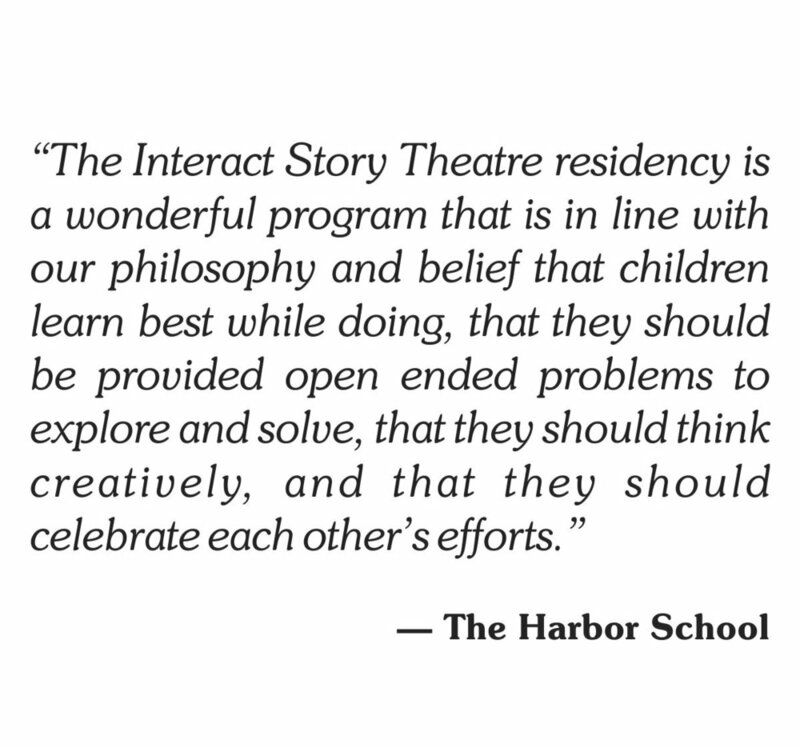 On Friday, September 14; Friday, September 21; and Friday, September 28; InterAct Story Theatre hosts two special theatre field trip each day for elementary schools and homeschool audiences--with great discounted ticket rates! Voytto Tech: a scifi fable connects with curriculum objectives in STEM Learning, Reading Literature and Speaking & Listening. 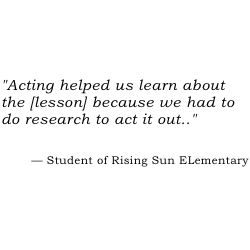 The play also takes on the Character Education topics of conflict resolution and bullying in school, and offers schools an opportunity to open up dialogue about these complex issues in an engaging and interactive way. Teacher resource materials and parent guides containing pre-performance and post-performance activities are available. For more information about special rates for school groups and homeschool groups, please contact us at info@interactstory.com! Voytto Tech: a scifi fable. An interactive outer space show for kids and families combining science, engineering, and technology with a story about bullying and social inequity. near the Silver Spring Metro station. Note for Parents and Teachers: For the safety of everyone, children must be under the direct supervision of a parent, teacher or responsible adults at all times while at the Montgomery College Cultural Arts Center. This production is supported in part by a grant from the Maryland State Arts Council. On the web at MSAC.org. Also, supported in part by Arts and Humanities Council of Montgomery County, the Montgomery County government and the generous support of a legion of donors and partners. Thank you for supporting arts for kids and families in Maryland! 7995 Georgia Avenue is located at the corner of Georgia, East-West Highway and MD 410. Our public & accessible entrance is located off Georgia and on King Street, across from the Holy Cross Clinic. Landmarks: A Seven-Eleven & Comfort Inn are located directly across Georgia Avenue from the Cultural Arts Center parking entrances. From the Beltway: Exit at Georgia Avenue (Exit 31) south, go 2 miles to Cultural Arts Center on left immediately past the intersection of East West Highway and Georgia Avenue. From Rockville: Veirs Mill Rd. to Wheaton, then right (south) on Georgia Ave.
From Bethesda: East-West Highway to Silver Spring, then right on Georgia Ave. 1 block on left. From DC: Connecticut Ave. north, right on East-West Highway, right on Georgia Ave. 1 block on left. Georgia Ave. north to Silver Spring, 1 block past Blair Road on right. Red Line to Silver Spring. Walk to East-West Highway. Left on E-W Hwy, 1/2 mile to CAC. You may want to take a taxi from the metro to CAC. Enter campus complex via King Street or Jessup Blair Drive from Georgia Avenue. Acceptable Parking Places When Attending a Performance: West Parking Garage or Lot W-1 You must park in a legal space (do not park in pre-labeled spaces such as “Dean”). Watch out for parking on the end of parking rows. You must be between two parking space lines. If you are parked in an illegal space you will be ticketed. WEST PARKING GARAGE: enter via Jessup Blair Drive (quicker) or King Street, drive straight then turn into garage. ENTER-- Public Parking garage entrance (not faculty staff entrance). After parking, take the King Street elevator at the north end of the structure, and it's a very short walk to the CAC up King Street. W-1 LOT is located directly behind the Cultural Arts Center. Enter via King Street (quicker) or Jessup Blair Drive. If entering via Jessup Blair, continue around underneath the far end of the parking garage. Accessible parking spaces are located immediately adjacent to the Cultural Arts Center in the W-1 parking lot (must have hang-tag or license plate designation for this parking). Ramp is located on King Street immediately adjacent to the main entrance of the CAC. Our 500 seat theatre (Theatre I) is equipped with a large number of accessible seats. Many of our events are rentals and we do not control those sales. However, when the CAC is selling tickets for events accessible seats are booked exclusively by the box office. If you have already purchased seats and would like to exchange them for accessible seating, then you must call the box office directly at 240-567-5775. This type of seating is held back from general sales until 30 minutes prior to show time. In the case of close-to-capacity performance sales, those seats are released last to general sales.